Humpback Lake is located approximately 60 miles from Ketchikan Alaska, deep in the heart of the Misty Fjords National Monument. Imagine being only one hour away from sitting next to a private waterfall in your own lakeside hot tub. Once you arrive, you will also see that the lake is 6 miles long! You can make arrangements to secure a motor and fuel prior to your departure or use the two private boats with oars. There is no road access to the monument and the lake is a 45 minute floatplane ride or a three week hike through some of the most extreme terrain in North America! The flight to the Humpback Chalet will treat you to one of the most spectacular flightseeing tours of a lifetime. 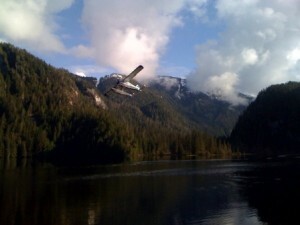 We highly recommend chartering a floatplane from Taquan Air to be guaranteed safety and service. If you would like to rent an outboard, you can make arrangements with Alaska Outboard or Alaska Wilderness Outfitting. Both companies will accept credit cards to reserve your motor, deliver it with fuel to your air carrier, and then pick it up when you arrive back to Ketchikan. They are also both locally owned and operated. It is also recommended that in case of an emergency and due to the sheer remoteness of Humpback Lake, you can rent or borrow an Emergency Locator Transmitter. These devices are available through the Ketchikan North Tongass Fire Department on loan or can be rented from various service providers. Carrying a satellite phone is also a good idea; because of its remote location cellular phones do not work at the cabin and a radio is not provided.